Click here to get a copy of our free catalog OR instantly download a copy of our catalog in PDF format. Our Custom Magic Drawer Box Tricks are fun and easy to perform – absolutely no slight of hand is required! With the Magic Drawer Trick, the Magician places an object, such as a dollar bill, inside the empty box and closes it. Then, the Magician reopens the Magic Number Box, and the object has disappeared only to have been replaced with a custom/promotional message. (For insertion of a special printed message, add $0.25 (G) per trick.) The trick can also be performed in reverse! 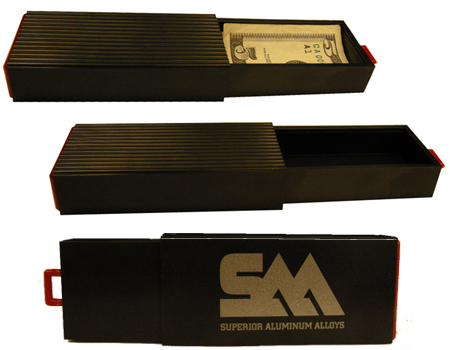 Each Custom Imprinted Magic Drawer Trick features your one- or two-color logo imprinted on one side of the box. The Magic Tricks come individually packaged in heat-sealed plastic poly bags. © 2019 Kardwell International. The contents of this web site are the sole property of Kardwell International.